A REVOLUTIONARY IONIC FOOTBATH&###xA0;DETOX SYSTEM. Introducing the IonExchange&###x2122; Ionic Detox System &###x2013; the most powerful and effective footbath system available on the market. Born from the dissatisfaction customers faced with products currently available, &###xA0; we are proud to present our patent-pending system which combines Power, Effectiveness, and Quality into one package. Experience the Premiere Quality of the IonExchange Detox System&##xA0. See Our Customer Testimonials at the Bottom of this Listing! Please Watch Our Video in Action! 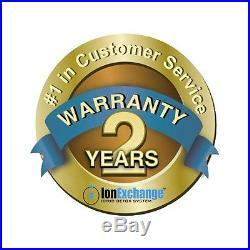 IonExchange is a company that believes in producing the highest quality products at the most affordable prices. Systems of comparable quality cost thousands! And even then, they do not come close to the power of the IonExchange&###xA0;Detox System. Our Dual Plate Array is the first of its kind – featuring the largest surface area of any system! Our Array is patent-pending and is designed to provide the most surface area with its four plate configuration. A durable Protective Outer Casing protects the user and the Array. Water-sealed wiring prevents premature cable corrosion and failure. Built like a tank, no other Array comes close! Maximize the life of the array with a convenient “Array Maximizer” switch which ensures that all parts of the array are being consumed evenly, maximizing the life and performance of the Array. Energize and Detoxify with the IonExchange&###x2122;&###xA0;Ionic Detox System! We’ve included everything you need to get started quickly. Dead Sea & Mediterranean Salt Mix. The IonExchange&###xA0;System is for those who desire the best – it is the fastest and strongest system available to help you in your journey towards health! 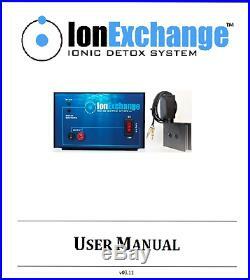 Users of the IonExchange&###xA0;Detox System report. More energy throughout the day. A better night’s sleep. A stronger immune system response to illnesses and diseases. CFS (Chronic Fatigue Syndrome). Every person is different but the principles of detoxification are the same. It’s simple: detox your body and feel the difference! The health benefits of negative ions are well known, and their unique properties are what makes an ionic footbath so effective. When water is ionized and split into H+ and OH- ions, these ions are able to enter the body through the 4,000 large pores of the feet. A detox footbath offers a way to utilize this opportunity to revitalize and cleanse yourself with all-natural mechanisms. At this stage, the circulatory and lymphatic systems transport the ions throughout the body. The ions from the footbath neutralize oppositely charged toxins in the cells that are normally slow to exit the body. In this way, all the body’s organs can become energized and stimulated to function optimally. &###xA0; The body then rids itself of these toxins through its normal processes of urination, defecation and sweating. An Ionic Footbath stimulates all the organs in your body, as they are ALL connected to your feet through the nervous system. There are more sweat glands in your feet than anywhere else on your body. An Ionic Footbath stimulates the 2,000 sweat glands in EACH foot, encouraging detox of accumulated toxins in the body from more than 4,000 pores. Best results come with multiple sessions. You will most likely notice positive changes within a just few sessions. &###xA0;We look forward to hearing from you! We will do our best to get back to you as soon as possible. First year labor and parts free. Second year labor is free. Array Unit is a consumable item. It is guaranteed to be free of manufacturing defects. If any defect is present or in case of premature failure, we will gladly replace or repair. Our Arrays Are Proudly Manufactured in the U. Ordering Replacements & Supplies. 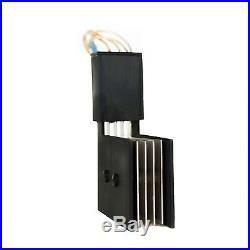 The IonExchange&###xA0;Array is a consumable item. Although your Array has been built to last, it will eventually need to be replaced. The life of your Array depends on the duration and frequency of sessions, as well as the water quality and the amount of salt used during a session. Your Array will need to be replaced when it becomes brittle from corrosion, and no longer produces sufficient hydrolysis action (such as bubbling). The IonExchange&###xA0;Detox System is NOT to be considered a “Medical Device” and no implication or claims are made regarding the healing of any medical problem. The IonExchange Detox System is safe for most people; however there are a few contraindications: this machine should not be used by individuals who are epileptic or hemophiliac, or those with a pacemaker, implanted organs or on blood thinners. &###xA0;It should also not be used by children under age 8, or a person during pregnancy or lactation. Do not use if you are allergic or sensitive to iron oxide. A Few Customer Testimonials. The ions produced in the water happened much faster than the one at the spa. I know the water may contribute to the colors as the water is ionized and with that said there were so many more colors and darker. At about 18 minutes into the session with your machine&##x2026. (right after I switched the switch) my head felt lighter/clearer. That night I slept through the night (that never happens). The next night I woke one time but slept more soundly than normal. I don&###x2019;t know if this has anything to do with the machine but I lost&###xA0; some weight AND I suspect this does have something to do with the machine&##x2026. My hands/joints/fingers did not hurt for the first time in&###xA0; years. None of these &###x2018;effects&###x2019; happened with the spa machine&##x2026. I love the machine and thank you so very much. Boo of Cardinal, VA November 2016. We received and started using our IonExchange Foot Bath approximately 5-6 weeks ago. &###xA0; My Daughter (20), Son (19) and I were all diagnosed with Chronic Lyme Disease approximately 3 years ago. &###xA0; My Son also lives his life with a vaccine injury (autism). &###xA0; Life has been a daily struggle and just 6 short months ago we were homebound, sick and not functioning. &###xA0; Since the addition of the IonExchange foot bath I have noticed several amazing blessings. &###xA0; First we have more energy. &###xA0; My son is now taking us on 2 hour walking expeditions which he hasn&###x2019;t done in years. &###xA0; My daughter says she just feels better. &###xA0; But the best part is, after a couple of years of quiet, I hear my son&###x2019;s voice again. &###xA0; He is talking, singing and smiling a lot more. &###xA0;&###xA0; I can&###x2019;t wait to see what changes we will see in the coming months. &###xA0; I would love to update it as we continue. Carlene of Wisconsin October 7 &###x2013; 2015. What a difference compared to my previous arrays&##x201D. D8 (462)&###xA0;&###xA0;&###xA0;&###xA0;&###xA0;&###xA0;&###xA0;&###xA0;&###xA0;&###xA0; Dec 10 &###x2013; 2014&###xA0;&###xA0;&###xA0;&###xA0;&###xA0;&###xA0;&###xA0;&###xA0;&###xA0;&###xA0;&###xA0;&###xA0;&###xA0;&###xA0; Rogers AR &###xA0;&###xA0;&###xA0;&###xA0;&###xA0;&##xA0. My experience with IonExchange Ionic Detox Foot Bath. It has perform exactly as it has been shown. I’m impressed with the Array as well, it has a long life span that helps detox. For anyone looking for a high quality American made Ion Foot Detox I recommend it. I love this lovely machine! And I thank you IonExchange Staff whom may be address. God bless you all keep on making good quality arrays and Ion detox machines. From a satisfied customer. I did my research and read many reviews, both positive and negative. I&###x2019;m very toxic with heavy metals, diagnosed with fibromyalgia. I just finished my 4th treatment and feeling less achy and stuff. Great product and very easy to use. 37 (26)&###xA0;&###xA0;&###xA0;&###xA0;&###xA0;&###xA0;&###xA0;&###xA0;&###xA0;&###xA0;&###xA0;&###xA0; &###xA0;&###xA0;&###xA0;&###xA0;&###xA0;&###xA0;Mar-31-14-14 12:46:26 PDT&###xA0;&###xA0;&###xA0;&###xA0;&###xA0;&###xA0;&###xA0;&###xA0;&###xA0;&###xA0;&###xA0;&###xA0;&###xA0;&###xA0; Miami&###xA0; FL 33157. If I can give you 10 out of 5 stars, I would! It works exactly as described. I have already spoken with several people who are willing to try it. I just saw hell in a bucket.. I have had knee problems and joint issues from being a athlete. I felt like my health have been going down hill because of all the stress I had going on. I finally decided to take things in my own hands. After the first treatment that night I felt a big difference of change in my knee. It was definitely embarrassing of all the toxins that comes out. But its for the better after about the third treatment. I was feeling lighter and felt more energy than I felt in a while. I even noticed the difference in sleep I slept deeper and I woke up and wasn&###x2019;t tired. I highly recommend this machine. The questions I had the staff was very knowledgeable about products and answered all of my questions. I&###x2019;m confident this will help me in a major way along my football career. 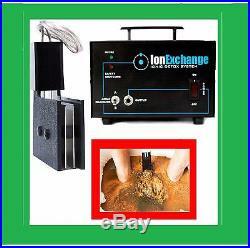 The item “IonExchange Detox Ion Ionic Foot Bath Foot Detox Machine Practitioner Package” is in sale since Wednesday, December 03, 2014. This item is in the category “Health & Beauty\Natural & Alternative Remedies\Ion Foot Baths”. The seller is “fnkbstudios” and is located in Maryland, USA. This item can be shipped to United States. A REVOLUTIONARY IONIC FOOTBATH DETOX SYSTEM. 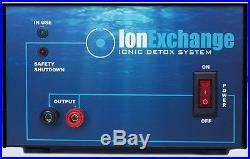 Introducing the IonExchange Ionic Detox System the most powerful and effective footbath system available on the market. Born from the dissatisfaction customers faced with products currently available, we are proud to present our patent-pending system which combines Power, Effectiveness, and Quality into one package. IonExchange is a company that believes in producing the highest quality products at the most affordable prices. Systems of comparable quality cost thousands! And even then, they do not come close to the power of the IonExchange Detox System. Our Dual Plate Array is the first of its kind – featuring the largest surface area of any system! Our Stainless Steel Plates are strong and thick with a durable Protective Outer Casing protects the user and the Array. Also our water-sealed wiring prevents premature cable corrosion and failure. Built like a tank, no other Array comes close! Our Array can give more sessions than any manufacturers in the market right now. That’s the reason so many doctors and Practioners are replacing their Arrays with ours and they are very happy with our products. Our Plates are made out of quality Stainless steel, bigger in size and no cut outs from the Plate. Because of the solid plate, it will produce the maximum ionization in the water. Experience the Premiere Quality of the IonExchange Detox System. See Our Customer Testimonials at the Bottom of this Listing! We’ve included everything you need to get started quickly. Dead Sea & Mediterranean Salt Mix. System does not come with a basin or linning. The IonExchange System is for those who desire the best – it is the fastest and strongest system available to help you in your journey towards health! Users of the IonExchange Detox System report. More energy throughout the day. A better night’s sleep. A stronger immune system response to illnesses and diseases. CFS (Chronic Fatigue Syndrome). Every person is different but the principles of detoxification are the same. It’s simple: detox your body and feel the difference! The health benefits of negative ions are well known, and their unique properties are what makes an ionic footbath so effective. When water is ionized and split into H+ and OH- ions, these ions are able to enter the body through the 4,000 large pores of the feet. A detox footbath offers a way to utilize this opportunity to revitalize and cleanse yourself with all-natural mechanisms. At this stage, the circulatory and lymphatic systems transport the ions throughout the body. The ions from the footbath neutralize oppositely charged toxins in the cells that are normally slow to exit the body. In this way, all the body’s organs can become energized and stimulated to function optimally. The body then rids itself of these toxins through its normal processes of urination, defecation and sweating. An Ionic Footbath stimulates all the organs in your body, as they are ALL connected to your feet through the nervous system. There are more sweat glands in your feet than anywhere else on your body. An Ionic Footbath stimulates the 2,000 sweat glands in EACH foot, encouraging detox of accumulated toxins in the body from more than 4,000 pores. Best results come with multiple sessions. You will most likely notice positive changes within a just few sessions. We look forward to hearing from you! We will do our best to get back to you as soon as possible. Array Unit is a consumable item. It is guaranteed to be free of manufacturing defects. If any defect is present or in case of premature failure, we will gladly replace or repair. Our Arrays Are Proudly Manufactured in the U. 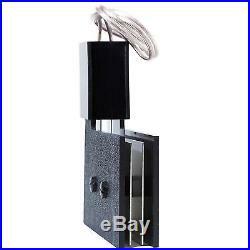 Ordering Replacements & Supplies. The IonExchange Array is a consumable item. Although your Array has been built to last, it will eventually need to be replaced. The life of your Array depends on the duration and frequency of sessions, as well as the water quality and the amount of salt used during a session. Your Array will need to be replaced when it becomes brittle from corrosion, and no longer produces sufficient hydrolysis action (such as bubbling). The IonExchange Detox System is NOT to be considered a “Medical Device” and no implication or claims are made regarding the healing of any medical problem. The IonExchange Detox System is safe for most people; however there are a few contraindications: this machine should not be used by individuals who are epileptic or hemophiliac, or those with a pacemaker, implanted organs or on blood thinners. It should also not be used by children under age 8, or a person during pregnancy or lactation. Do not use if you are allergic or sensitive to iron oxide. A Few Customer Testimonials. The ions produced in the water happened much faster than the one at the spa. I know the water may contribute to the colors as the water is ionized and with that said there were so many more colors and darker. At about 18 minutes into the session with your machine. (right after I switched the switch) my head felt lighter/clearer. That night I slept through the night (that never happens). The next night I woke one time but slept more soundly than normal. None of these effects happened with the spa machine. I love the machine and thank you so very much. Boo of Cardinal, VA November 2016. We received and started using our IonExchange Foot Bath approximately 5-6 weeks ago. My Daughter (20), Son (19) and I were all diagnosed with Chronic Lyme Disease approximately 3 years ago. My Son also lives his life with a vaccine injury (autism). Life has been a daily struggle and just 6 short months ago we were homebound, sick and not functioning. 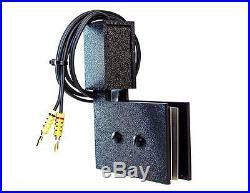 Since the addition of the IonExchange foot bath I have noticed several amazing blessings. First we have more energy. My son is now taking us on 2 hour walking expeditions which he hasnt done in years. My daughter says she just feels better. But the best part is, after a couple of years of quiet, I hear my sons voice again. He is talking, singing and smiling a lot more. I cant wait to see what changes we will see in the coming months. I would love to update it as we continue. Carlene of Wisconsin October 7 2015. What a difference compared to my previous arrays. D8 (462) Dec 10 2014 Rogers AR. My experience with IonExchange Ionic Detox Foot Bath. It has perform exactly as it has been shown. I’m impressed with the Array as well, it has a long life span that helps detox. For anyone looking for a high quality American made Ion Foot Detox I recommend it. I love this lovely machine! And I thank you IonExchange Staff whom may be address. God bless you all keep on making good quality arrays and Ion detox machines. From a satisfied customer. I did my research and read many reviews, both positive and negative. Im very toxic with heavy metals, diagnosed with fibromyalgia. I just finished my 4th treatment and feeling less achy and stuff. Great product and very easy to use. 37 (26) Mar-31-14-14 12:46:26 PDT Miami FL 33157. If I can give you 10 out of 5 stars, I would! It works exactly as described. I have already spoken with several people who are willing to try it. I just saw hell in a bucket.. I have had knee problems and joint issues from being a athlete. I felt like my health have been going down hill because of all the stress I had going on. I finally decided to take things in my own hands. After the first treatment that night I felt a big difference of change in my knee. It was definitely embarrassing of all the toxins that comes out. But its for the better after about the third treatment. I was feeling lighter and felt more energy than I felt in a while. I even noticed the difference in sleep I slept deeper and I woke up and wasnt tired. I highly recommend this machine. The questions I had the staff was very knowledgeable about products and answered all of my questions. Im confident this will help me in a major way along my football career. Thank you very much for viewing our listing! The item “IonExchange Detox Ionic Foot Bath Foot Detox Spa Cleanse Machine FREE SHIPPING” is in sale since Monday, September 22, 2014. This item is in the category “Health & Beauty\Natural & Alternative Remedies\Ion Foot Baths”. The seller is “fnkbstudios” and is located in Maryland, USA. This item can be shipped to United States. A REVOLUTIONARY IONIC FOOTBATH DETOX SYSTEM. 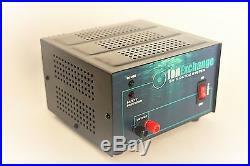 Introducing the IonExchange Ionic Detox System the most powerful and effective footbath system available on the market. Born from the dissatisfaction customers faced with products currently available, we are proud to present our patent-pending system which combines Power, Effectiveness, and Quality into one package. IonExchange is a company that believes in producing the highest quality products at the most affordable prices. Systems of comparable quality cost thousands! And even then, they do not come close to the power of the IonExchange Detox System. Our Dual Plate Array is the first of its kind – featuring the largest surface area of any system! Our Stainless Steel Plates are strong and thick with a durable Protective Outer Casing protects the user and the Array. Also our water-sealed wiring prevents premature cable corrosion and failure. Built like a tank, no other Array comes close! Our Array can give more sessions than any manufacturers in the market right now. That’s the reason so many doctors and Practioners are replacing their Arrays with ours and they are very happy with our products. Our Plates are made out of quality Stainless steel, bigger in size and no cut outs from the Plate. Because of the solid plate, it will produce the maximum ionization in the water. Experience the Premiere Quality of the IonExchange Detox System. See Our Customer Testimonials at the Bottom of this Listing! We’ve included everything you need to get started quickly. Dead Sea & Mediterranean Salt Mix. System does not come with a basin or linning. The IonExchange System is for those who desire the best – it is the fastest and strongest system available to help you in your journey towards health! Users of the IonExchange Detox System report. More energy throughout the day. A better night’s sleep. A stronger immune system response to illnesses and diseases. CFS (Chronic Fatigue Syndrome). Every person is different but the principles of detoxification are the same. It’s simple: detox your body and feel the difference! The health benefits of negative ions are well known, and their unique properties are what makes an ionic footbath so effective. When water is ionized and split into H+ and OH- ions, these ions are able to enter the body through the 4,000 large pores of the feet. A detox footbath offers a way to utilize this opportunity to revitalize and cleanse yourself with all-natural mechanisms. At this stage, the circulatory and lymphatic systems transport the ions throughout the body. The ions from the footbath neutralize oppositely charged toxins in the cells that are normally slow to exit the body. In this way, all the body’s organs can become energized and stimulated to function optimally. The body then rids itself of these toxins through its normal processes of urination, defecation and sweating. An Ionic Footbath stimulates all the organs in your body, as they are ALL connected to your feet through the nervous system. There are more sweat glands in your feet than anywhere else on your body. An Ionic Footbath stimulates the 2,000 sweat glands in EACH foot, encouraging detox of accumulated toxins in the body from more than 4,000 pores. Best results come with multiple sessions. You will most likely notice positive changes within a just few sessions. We look forward to hearing from you! We will do our best to get back to you as soon as possible. Array Unit is a consumable item. It is guaranteed to be free of manufacturing defects. If any defect is present or in case of premature failure, we will gladly replace or repair. Our Arrays Are Proudly Manufactured in the U. Ordering Replacements & Supplies. The IonExchange Array is a consumable item. Although your Array has been built to last, it will eventually need to be replaced. The life of your Array depends on the duration and frequency of sessions, as well as the water quality and the amount of salt used during a session. Your Array will need to be replaced when it becomes brittle from corrosion, and no longer produces sufficient hydrolysis action (such as bubbling). The IonExchange Detox System is NOT to be considered a “Medical Device” and no implication or claims are made regarding the healing of any medical problem. The IonExchange Detox System is safe for most people; however there are a few contraindications: this machine should not be used by individuals who are epileptic or hemophiliac, or those with a pacemaker, implanted organs or on blood thinners. It should also not be used by children under age 8, or a person during pregnancy or lactation. Do not use if you are allergic or sensitive to iron oxide. A Few Customer Testimonials. The ions produced in the water happened much faster than the one at the spa. I know the water may contribute to the colors as the water is ionized and with that said there were so many more colors and darker. At about 18 minutes into the session with your machine. (right after I switched the switch) my head felt lighter/clearer. That night I slept through the night (that never happens). The next night I woke one time but slept more soundly than normal. None of these effects happened with the spa machine. I love the machine and thank you so very much. Boo of Cardinal, VA November 2016. We received and started using our IonExchange Foot Bath approximately 5-6 weeks ago. My Daughter (20), Son (19) and I were all diagnosed with Chronic Lyme Disease approximately 3 years ago. My Son also lives his life with a vaccine injury (autism). Life has been a daily struggle and just 6 short months ago we were homebound, sick and not functioning. Since the addition of the IonExchange foot bath I have noticed several amazing blessings. First we have more energy. My son is now taking us on 2 hour walking expeditions which he hasnt done in years. My daughter says she just feels better. But the best part is, after a couple of years of quiet, I hear my sons voice again. He is talking, singing and smiling a lot more. I cant wait to see what changes we will see in the coming months. I would love to update it as we continue. Carlene of Wisconsin October 7 2015. What a difference compared to my previous arrays. D8 (462) Dec 10 2014 Rogers AR. My experience with IonExchange Ionic Detox Foot Bath. It has perform exactly as it has been shown. I’m impressed with the Array as well, it has a long life span that helps detox. For anyone looking for a high quality American made Ion Foot Detox I recommend it. I love this lovely machine! And I thank you IonExchange Staff whom may be address. God bless you all keep on making good quality arrays and Ion detox machines. From a satisfied customer. I did my research and read many reviews, both positive and negative. 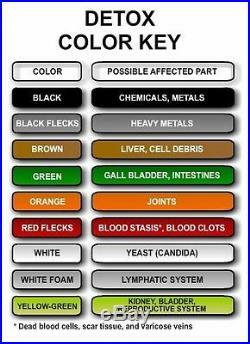 Im very toxic with heavy metals, diagnosed with fibromyalgia. I just finished my 4th treatment and feeling less achy and stuff. Great product and very easy to use. 37 (26) Mar-31-14-14 12:46:26 PDT Miami FL 33157. If I can give you 10 out of 5 stars, I would! It works exactly as described. I have already spoken with several people who are willing to try it. I just saw hell in a bucket.. I have had knee problems and joint issues from being a athlete. I felt like my health have been going down hill because of all the stress I had going on. I finally decided to take things in my own hands. After the first treatment that night I felt a big difference of change in my knee. It was definitely embarrassing of all the toxins that comes out. But its for the better after about the third treatment. I was feeling lighter and felt more energy than I felt in a while. I even noticed the difference in sleep I slept deeper and I woke up and wasnt tired. I highly recommend this machine. The questions I had the staff was very knowledgeable about products and answered all of my questions. Im confident this will help me in a major way along my football career. Thank you very much for viewing our listing! The item “IonExchange Foot Bath Ion Ionic Foot Detox Spa Machine” is in sale since Saturday, January 31, 2015. This item is in the category “Health & Beauty\Natural & Alternative Remedies\Ion Foot Baths”. The seller is “fnkbstudios” and is located in Maryland, USA. This item can be shipped to United States. A REVOLUTIONARY IONIC FOOTBATH DETOX SYSTEM. IonExchange Control Unit. IonExchange Array Unit – SINGLE ARRAY PACKAGE! 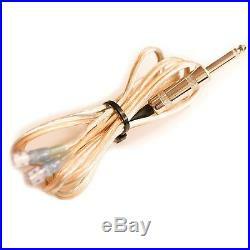 Array Cable Connector. 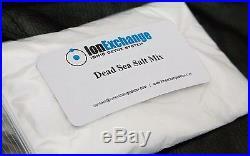 Dead Sea Salt and Mediterranean Sea Salt Mix. 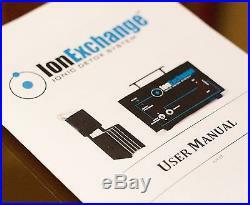 IonExchange User Manual. Introducing the IonExchange Ionic Detox System the most effective footbath system available on the market. Born from the dissatisfaction customers faced with products currently available, we are proud to present our patent-pending system which combines Power, Effectiveness, and Quality into one package. 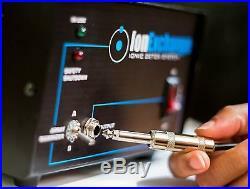 IonExchange is a company that believes in producing the highest quality products at the most affordable prices. Systems of comparable quality will cost you thousands! Our Array is designed with a durable Protective Outer Casing protects the user and the Array. Built like a tank, no other Array comes close! Experience the premiere quality of an IonExchange footbath. Energize and Detoxify with the IonExchange Ionic Detox System! Benefits of an IonExchange Ionic Footbath. The IonExchange System is for those who desire the best – it is the fastest and strongest system available to help you in your journey towards health! Users of the IonExchange Detox System report. More energy throughout the day. A better night’s sleep. A stronger immune system response to illnesses and diseases. Skin conditions such as Eczema and Psoriasis. CFS (Chronic Fatigue Syndrome). Every person is different but the principles of detoxification are the same. It’s simple: detox your body and feel the difference! The health benefits of negative ions are well known, and their unique properties are what makes an ionic footbath so effective. When water is ionized and split into H+ and OH- ions, these ions are able to enter the body through the 4,000 large pores of the feet. A detox footbath offers a way to utilize this opportunity to revitalize and cleanse yourself with all-natural mechanisms. At this stage, the circulatory and lymphatic systems transport the ions throughout the body. The ions from the footbath neutralize oppositely charged toxins in the cells that are normally slow to exit the body. In this way, all the body’s organs can become energized and stimulated to function optimally. The body then rids itself of these toxins through its normal processes of urination, defecation and sweating. An Ionic Footbath stimulates all the organs in your body, as they are ALL connected to your feet through the nervous system. There are more sweat glands in your feet than anywhere else on your body. An Ionic Footbath stimulates the 2,000 sweat glands in EACH foot, encouraging detox of accumulated toxins in the body from more than 4,000 pores. Best results come with multiple sessions. You will most likely notice positive changes within a just few sessions. Ordering Replacements & Supplies. The IonExchange Array is a consumable item. Although your Array has been built to last, it will eventually need to be replaced. The life of your Array depends on the duration and frequency of sessions, as well as the water quality and the amount of salt used during a session. Your Array will need to be replaced when it becomes brittle from corrosion, and no longer produces sufficient hydrolysis action (such as bubbling). All other supplies including Dead Sea Salt Mix, Extension Cable, etc. Are also available for order. The IonExchange Detox System is NOT to be considered a “Medical Device” and no implication or claims are made regarding the healing of any medical problem. The IonExchange Detox System is safe for most people; however there are a few contraindications: this machine should not be used by individuals who are epileptic or hemophiliac, or those with a pacemaker, implanted organs or on blood thinners. It should also not be used by children under age 8, or a person during pregnancy or lactation. Do not use if you are allergic or sensitive to Iron Oxide. System must be in like-new condition. First year labor and parts free. Second year labor is free. Array Unit is a consumable item. It is guaranteed to be free of manufacturing defects. If any defect is present or in case of premature failure, we will gladly replace or repair. We look forward to hearing from you! We will do our best to get back to you within 12-24 hours. The item “IonExchange Detox Ion Ionic Foot Bath Foot Detox Spa Cleanse Machine” is in sale since Thursday, February 20, 2014. This item is in the category “Health & Beauty\Natural & Alternative Remedies\Ion Foot Baths”. The seller is “fnkbstudios” and is located in USA. This item can be shipped to United States. A REVOLUTIONARY IONIC FOOTBATH DETOX SYSTEM. 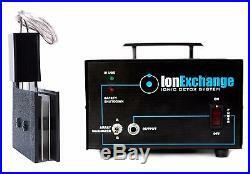 Introducing the IonExchange Ionic Detox System the most powerful and effective footbath system available on the market. Born from the dissatisfaction customers faced with products currently available, we are proud to present our patent-pending system which combines Power, Effectiveness, and Quality into one package. Experience the Premiere Quality of the IonExchange Detox System. 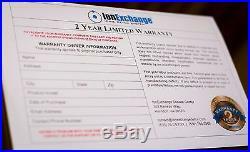 IonExchange is a company that believes in producing the highest quality products at the most affordable prices. Systems of comparable quality cost thousands! And even then, they do not come close to the power of the IonExchange Detox System. Our Dual Plate Array is the first of its kind – featuring the largest surface area of any system! Our Stainless Steel Plates are strong and thick with a durable Protective Outer Casing protects the user and the Array. Also our water-sealed wiring prevents premature cable corrosion and failure. Built like a tank, no other Array comes close! Our Array can give more sessions than any manufacturers in the market right now. That’s the reason so many doctors and Practioners are replacing their Arrays with ours and they are very happy with our products. Our Plates are made out of quality Stainless steel, bigger in size and no cut outs from the Plate. Because of the solid plate, it will produce the maximum ionization in the water. Energize and Detoxify with the IonExchange Ionic Detox System! See Our Customer Testimonials at the Bottom of this Listing! We’ve included everything you need to get started quickly. 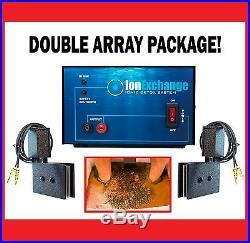 IonExchange Array Unit x 2. Dead Sea & Mediterranean Salt Mix. 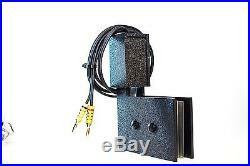 System does not come with a Tub or Linning. The IonExchange System is for those who desire the best – it is the fastest and strongest system available to help you in your journey towards health! Users of the IonExchange Detox System report. More energy throughout the day. A better night’s sleep. A stronger immune system response to illnesses and diseases. CFS (Chronic Fatigue Syndrome). Every person is different but the principles of detoxification are the same. It’s simple: detox your body and feel the difference! The health benefits of negative ions are well known, and their unique properties are what makes an ionic footbath so effective. When water is ionized and split into H+ and OH- ions, these ions are able to enter the body through the 4,000 large pores of the feet. A detox footbath offers a way to utilize this opportunity to revitalize and cleanse yourself with all-natural mechanisms. At this stage, the circulatory and lymphatic systems transport the ions throughout the body. The ions from the footbath neutralize oppositely charged toxins in the cells that are normally slow to exit the body. In this way, all the body’s organs can become energized and stimulated to function optimally. The body then rids itself of these toxins through its normal processes of urination, defecation and sweating. An Ionic Footbath stimulates all the organs in your body, as they are ALL connected to your feet through the nervous system. There are more sweat glands in your feet than anywhere else on your body. An Ionic Footbath stimulates the 2,000 sweat glands in EACH foot, encouraging detox of accumulated toxins in the body from more than 4,000 pores. Best results come with multiple sessions. You will most likely notice positive changes within a just few sessions. We look forward to hearing from you! We will do our best to get back to you as soon as possible. Array Unit is a consumable item. It is guaranteed to be free of manufacturing defects. If any defect is present or in case of premature failure, we will gladly replace or repair. Our Arrays Are Proudly Manufactured in the U. Ordering Replacements & Supplies. The IonExchange Array is a consumable item. Although your Array has been built to last, it will eventually need to be replaced. The life of your Array depends on the duration and frequency of sessions, as well as the water quality and the amount of salt used during a session. Your Array will need to be replaced when it becomes brittle from corrosion, and no longer produces sufficient hydrolysis action (such as bubbling). The IonExchange Detox System is NOT to be considered a “Medical Device” and no implication or claims are made regarding the healing of any medical problem. The IonExchange Detox System is safe for most people; however there are a few contraindications: this machine should not be used by individuals who are epileptic or hemophiliac, or those with a pacemaker, implanted organs or on blood thinners. It should also not be used by children under age 8, or a person during pregnancy or lactation. Do not use if you are allergic or sensitive to iron oxide. A Few Customer Testimonials. The ions produced in the water happened much faster than the one at the spa. I know the water may contribute to the colors as the water is ionized and with that said there were so many more colors and darker. At about 18 minutes into the session with your machine. (right after I switched the switch) my head felt lighter/clearer. That night I slept through the night (that never happens). The next night I woke one time but slept more soundly than normal. None of these effects happened with the spa machine. I love the machine and thank you so very much. Boo of Cardinal, VA November 2016. 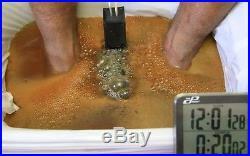 We received and started using our IonExchange Foot Bath approximately 5-6 weeks ago. My Daughter (20), Son (19) and I were all diagnosed with Chronic Lyme Disease approximately 3 years ago. My Son also lives his life with a vaccine injury (autism). Life has been a daily struggle and just 6 short months ago we were homebound, sick and not functioning. 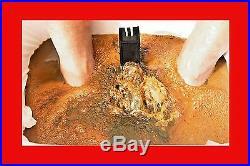 Since the addition of the IonExchange foot bath I have noticed several amazing blessings. First we have more energy. My son is now taking us on 2 hour walking expeditions which he hasnt done in years. My daughter says she just feels better. But the best part is, after a couple of years of quiet, I hear my sons voice again. He is talking, singing and smiling a lot more. I cant wait to see what changes we will see in the coming months. I would love to update it as we continue. Carlene of Wisconsin October 7 2015. What a difference compared to my previous arrays. D8 (462) Dec 10 2014 Rogers AR. My experience with IonExchange Ionic Detox Foot Bath. It has perform exactly as it has been shown. I’m impressed with the Array as well, it has a long life span that helps detox. For anyone looking for a high quality American made Ion Foot Detox I recommend it. I love this lovely machine! And I thank you IonExchange Staff whom may be address. God bless you all keep on making good quality arrays and Ion detox machines. From a satisfied customer. I did my research and read many reviews, both positive and negative. Im very toxic with heavy metals, diagnosed with fibromyalgia. I just finished my 4th treatment and feeling less achy and stuff. Great product and very easy to use. 37 (26) Mar-31-14-14 12:46:26 PDT Miami FL 33157. If I can give you 10 out of 5 stars, I would! It works exactly as described. I have already spoken with several people who are willing to try it. I just saw hell in a bucket.. I have had knee problems and joint issues from being a athlete. I felt like my health have been going down hill because of all the stress I had going on. I finally decided to take things in my own hands. After the first treatment that night I felt a big difference of change in my knee. It was definitely embarrassing of all the toxins that comes out. But its for the better after about the third treatment. I was feeling lighter and felt more energy than I felt in a while. I even noticed the difference in sleep I slept deeper and I woke up and wasnt tired. I highly recommend this machine. The questions I had the staff was very knowledgeable about products and answered all of my questions. Im confident this will help me in a major way along my football career. Thank you very much for viewing our listing! The item “IonExchange Detox Pro Package Ion Ionic Detox Foot Bath Foot Detox Spa Machine” is in sale since Tuesday, August 05, 2014. This item is in the category “Health & Beauty\Natural & Alternative Remedies\Ion Foot Baths”. The seller is “fnkbstudios” and is located in Maryland, USA. This item can be shipped to United States.